Goritsy town is one of the stops on the cruise route between Moscow and St. Petersburg. This small port is located on the shore of the Sheksna river. Already from the pier, you are able to see the walls of the The Goritsy Monastery of Resurrection and feel the spirit and stillness of this place. The city center offers variety of souvenirs and different snacks, and you might enjoy sightseeing without going too far from the ship. Nevertheless, the main attraction lays 7 km further from the town - the St. Cyril on the White Lake Monastery. Majority of tourists come to this place in order to witness the ancientness and greatness of this Monastery and Fortress of the past times. 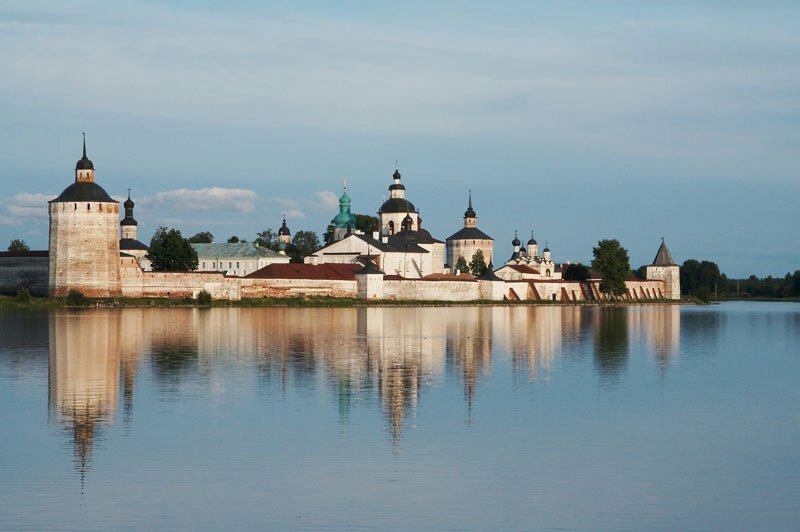 St. Cyril on the White Lake Monastery or Kirillo-Belozersky Monastery was founded in 1397. The monastery walls, constructed between 15th and 16th century, surrounds about 12 hectares of the inner territory. Monastery was intensively developed and was the largest and most influential Monastery in Russia. Monks were actively trading within and outside Russia. Enormous amounts of goods: bread, fish, salt and other products were stored in their stocks. Many cities were hosting their missions and warehouses. Monastery was not only the religious, role, but also served as a Fortress from the Northern invaders. During the uneasy 17th century, it was decided to construct new walls, which were 7 meters height, 2-3 meters in thickness and to strengthen them with 12 towers. Monks were not only improving fortifications, but also had 80 cannonry and 8000 items of different weapons for the defense. Historians assume that Tsarist government was spending so much money on empowering the Monastery for two reasons. On the one hand, it was there to protect the Northern areas from the intervention and create an impregnable bastion. On the other hand, due to the growing turmoil among the folks, tsars were hoping to use it as a hiding place in case of the uprising. Such dedication of the tsarist government to the Monastery can be linked to the personal affection and to the fact that the great duke Vasiliy the III and his wife Elena Glinskaya came here to pray for the birth of the son. Their wish was fulfilled, and the birth of the Ivan the Terrible was perceived as a sign of protection by the holy Cyril of the White Lake (the Saint Kirill Belozersky). Throughout all his life, Ivan the Terrible was showing special affection to this Monastery and in the very end of his life, just as his father, became a monk here. The St. Cyril on the White Lake Monastery has an exceptional history. Now it helps visitors to connect and reflect on past events through its architecture and survived manuscripts. The monastery churches, previously decorated with the most outstanding icons by hand of the Andrey Rublev (now they are located in the museums of Moscow and St. Petersburg), still resemble the greatness of the Russian orthodox church. And by any means, it is a place to visit for those who are willing to attain a deeper insight into Russian culture.